This is a catch-all page that provides access to information related to this site that does not necessarily blend with the contents of the other pages found here. You Can Fly Aboard a B-17! Did you ever consider the possibility that you could fly aboard a B-17? It's possible! Experience the sights and sounds of a vintage B-17. Feel the rush as you begin the take-off roll and four 1200-horsepower engines go to full throttle. Try to imagine how it must have felt flying into combat over occupied Europe for the first time. The 99th was part of the 12th Air Force when it was based in North Africa. Click on the patch for information about the 12th Air Force. A surprising number of B-17s are still flying. You can even get a ride aboard some of them! 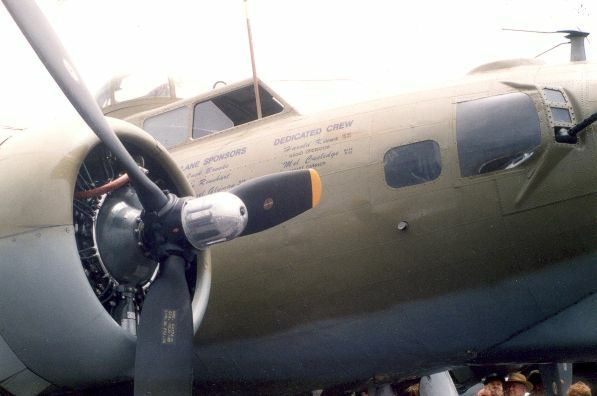 This site offers references to surviving B-17s, including some that still fly. There is a tired, weatherworn B-17 at the Chino Airport Planes of Fame exhibit in Chino, California that needs your help. This aircraft, Piccadilly Lily, was the last operational US Air Force B-17. The people at Planes of Fame are collecting donations to enable them to rebuild Piccadilly Lily so that she can fly once again. A lot of work and money is needed to return this static display aircraft to flying condition. I am a retired Electrical Engineer with more than 35 years of experience covering a broad range of areas, including analog circuit design, digital circuit design, hardware systems design, software design, and algorithm design. I hold BSEE and MSEE degrees, a Professional Engineer license in the State of California, a General Radiotelephone Operator license, and a California Community College Instructor Credential (Life) in two subject matter areas. I am also a Life Senior Member of the Institute of Electrical and Electronic Engineers (IEEE). From March of 1966 until October of 1969, I served in the U.S. Air Force where I was trained as an Aircraft Radio Repairman. After Tech School, I worked on F-105 Thunderchiefs and F‑4 Phantoms. The F‑105 and F‑4 were all‑weather fighter‑bombers and major players in the Vietnam War. From the beginning of the war, through 1969, the F‑105 dropped more tons of bombs on North Vietnam than the B‑52. From October 1968 to October 1969, I was assigned to the 388th Avionics Maintenance Squadron of the 388th Tactical Fighter Wing at Korat Royal Thai Air Force Base, located near Korat (Nakhon Ratchasima), Thailand.